Great Yarmouth is believed to be the first British town to suffer a fatality during an aerial bombardment. On 19 January 1915 the Zeppelin L3 attacked the town dropping around ten bombs on the St Peters Plain area. Martha Taylor and Samuel Smith were killed in separate explosions. A blue plaque on number 25 stands in their memory. On the same night the L4 attacked Kings Lynn killing two others. At the start of the war there were few effective weapons to combat the Zeppelin threat. Conventional bullets would pass harmlessly through the aluminium frame. However the craft was very vulnerable to incendiary bombs and bullets. If the hydrogen cells were breached the gas then mixed with the oxygen in the air causing the ship to explode. Though raids continued throughout the war there were no other casualties. Emma Flaxman lived with her parents at Wolseley Road just across the river from St Peters Plain. Her account of Zeppelin raids has been recorded by an actress. BBC: Was WW1 propaganda the birth of spin? 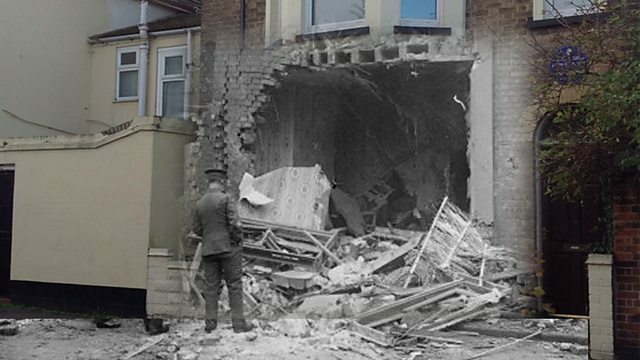 Zeppelin raids brought terror & destruction across the country.